My life is my own performance art, as yours is yours, and that I can understand, but I just can't quite get a staged performance I saw in NYC. Art makes you think, though. The piece above, by Performance Artist Marina Abramovic, is from an artist I'd never seen before. She performed in NYC at the Museum of Modern Art and now, a week later, I am still thinking about it. The photo above (credit and more here) is not what I saw. What I saw was this -- the artist sitting still all day in a chair looking at someone else sitting across from her and everyone around in the main two-story gallery at MoMA standing and watching her watch another. Yet it has stayed with me. I was glad to see on MoMA's facebook page that 99 people had, at MoMA's request, put forth questions to ask her. Others, too, wondered how you explain this. I think that perhaps the appeal of this one act, where she sits from museum opening until museum closing for the duration of the exhibit of her works (Marina Abromovic:The Artist is Present, on through May 31) is because we rarely sit and focus on just one person for long. now. anymore. And for sure not. in. stillness. That is my take on it. Art is, after all, what you make of it - the meaning it holds for you. But then, maybe I don't get it at all. This mash up of the classic song Stand By Me puts together a new new version with musicians from all over the world-- pretty interesting. After spending a day in Dallas with a daughter, old friends and a cousin, getting around a city I moved from in 1981 and found GPS navigation a real help all these years later, I was reminded once again how important it is to keep our ties, and to stand by those we love -- even if separated, as these musicians are, by many miles. The line between forgetfulness and ingratitude is fuzzy. I'm amused by the ads that seem to be aimed at men, especially the ones that seem to offer an answer to the guy who panics because he forgets that Valentine's Day is upon him. Cognitive Daily has an interesting study on men, women and Valentine gifts. Hold me, hang on tight. Obama's Inauguration: Be The Change? The official Inaugural Poster is by ...(who else, but) -- Shepard Fairey, whose famous Obama Poster now hangs in the Smithsonian's National Portrait Gallery. From an edgy street artist who understood propaganda and the power of the visual, this seems a little too official. I'll be watching the turn of words from a man who rose on rhetoric. Most Inaugural Addresses are forgettable. His might not be. And, the First Lady fashion as it relates to cultural statements, too. Signs of the times, the cultural semiotics of it all in visuals, dress and words. What was happening when you were born? I was amazed when I read through a birthday card for my father that told of things that had been happening the year he was born. House prices? Popular songs (they seemed to last for several years then, mother said). So I put together these links for what was happening during various years. Go to the flip for your birth year. Enjoy! What will the media focus on now? Once a winner is decided? SPINNING AT TOP SPEED: If you look at the media this morning (which I'm doing as part of my media study but that is another story) something is doubling down in a big jitterbug way with the trifecta of Fashion, Politics and Economics. Everything is bleeding red if you look at photos and headlines. My daughter emailed me this photo, at left, yesterday. A top NYTimes story (OK, not as top as the horrid economic news headlines after yesterday's 514 point fall in the Dow) was in Fashion & Style discussing the practicality of clothes like painter's pants. Yep, I wore those and top siders and army pants and jeans when I was on a very limited budget in college and highschool. Engineer boots, too. Yesterday I bought new fall clothing: one pair of black pants, one black turtleneck and two pairs of black socks. Austere? Well, NYC rubbed off on me with the practical black. It is practical and can be my uniform in these recessionary times. I'm also messaging practical and mourning, the latter for our world right now. Today, in Huffpo, an online newspaper that has soared in audience ratings in September getting its biggest readership last month since it started), that photo of Palin in red shoes, Wizard of Oz Dorothy-like. Any Southern woman knows that Good Girls Don't Wear Red Shoes. But that isn't the point. If you study media, you will realize that Google News is rising fast in the ratings for online news mainly because it can aggregate stories and run them by ranking of hits. You can tell the stories that are most resonating with online news readers. Today's second top story this morning? Sarah Palin's $150,000 makeover, a BBC News article. l hour ago (that would be about 6:40 AM ET) and the links w/ this: LATimes, NYT w/ headlines as links; Newspapers that also are carrying the story and getting a lot fo readership: SF Chronicle; NYDaily News; ChattahBox; Houston Chronicle: all 864 articles. The photo alongside that leading story has Palin in a red jacket. Third top story on Google News: Obama gaining, but must sway voters to defeat McCain, Baltimore Sun - l hour ago. Polls on race tightening, AP, same head story, Newsday; paper links only: AP, DeSoto Times Today, NYT, WaPo, all 2,159 news articles. Dire headlines are in all online news outlets I study, with Wall Street Journal, CNN and ABC all running the similar photo for their top stories of a home with a For Sale sign in the yard topped with a red-letter, all caps sign: FORECLOSURE since the lead story everywhere is September's numbers showing foreclosures up 71%. Yep, the media is dancing in the color red as the economy news seems dire in the media headlines and the 2008 political campaign is down to the last days. Henry Blodget runs a photo of Depression-era souplines today and discusses future jobless rates and all McCain and Obama have to say (it's the economy, stupid) is Joe the Plumber and Joe the Hedge Fund Guy. I'm wearing black jeans today, maybe voting early in New Mexico, telling my haircut guy to give me a 'do that is low-maintance as I'm cutting back. Like the red cape in the bullfighting arena, the red is swinging. Red, design-wise, is the most attention-getting color. That is why the media is using it. Red is also the color of accounting. You're either in the black or the red. Red is also a political color. While black used to be the main headline color, blue is for links in new media. Blue is the color of depression or sky. Many I know are seeing red, angry about the economy and the politics of it all. Others are blue, blue, blue about the economy. Soccer Mom? Hockey Mom? Call me Austerity Mom at the moment living in a Swing State that's red and blue. The White Sunglasses. That is the title of this art piece, at right. The youngest daughter is now out of her teens. She is putting her cool sunglasses (aren't daughters the best thing to have to stay with it????) on me. They are much more cool-istic on her. This was at a Mother's Day brunch. Special moments are always up for reinvention and so are we in this digital age. That Mother's Day Lunch, which happened before she left her teens, will always be remembered. I'm clinging to the remnants of REAL motherhood, when motherhood matters when children are young. Now I'm moving to Significant Motherhood, where living as a woman is a thing full of grace, once the children are grown. The glasses can filter all, change all, conceal all, be all. Women in White Sunglasses. Right on, mama. Housing, Changes: Roots of the Problem? How did we get here, needing a $700 billion bailout plan? That is all the news everywhere, including every conversation. Looking at media, how do you understand this? The comments in online articles (ABC News Blog: Stephanopoulos: Paulson Fears Deal May Collapse), have some clues. It has become political. The dollar has shed 33% of its value in the last few years and "economists warn that our economy is experience its worst crisis since The Great Depression" some warn and the president sparks fear, coming on tv to explain it. The Paulson Report? The various transcripts are there on Google. Some say it is unregulated derivatives. Some say it is consumers buying above their heads and using credit when they shouldn't. Some say it is executive pay. 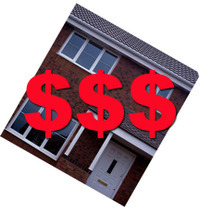 Some say it is loose lending practices, especially Fannie Mae easing credit in 1999 to aid mortgage lending (NYTimes). Some say it is greed. Some say it dates back to Robert Rubin and the Clinton Administration. Paulson says it is illiquid assets from loose mortgage lending. Books will be written to explain this complicated mess. It is very hard to understand, all these changes. Revolutions come in fits and starts. 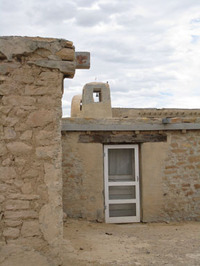 The Acoma Pueblo (photo, left), the oldest continuously inhabited village in the U.S. (Taos Pueblo also claims that status) here in New Mexico, was once atop a nearby mesa over 1,000 years ago, according to Acoma legend, but now all there is on Enchanted Mesa is dust. The new Acoma village, hundreds and hundreds of years old, doesn't have plumbing or electricity or gas and it sits atop a high mesa. Sky City, as it is called, wasn't accessible by cars until the middle of the last century when Hollywood wanted to make films and created a road to the top. Port-a-potties line the cliffside and pickups truck up water and propane tanks sit outside the dwellings. Acoma and our latest houses -- the distant exurbs in the U.S. -- are lonely outposts. The Boomer Chronicles wrote about a study released last week: 684,000 homeowners age 50 and older were either in foreclosure or delinquent on mortgage payments in the last six months of 2007. Homeowners age 50 and older represented about 28 percent of all delinquencies and foreclosures. The growing trend is that parents are living with their children - something I caught this week. Empty houses sit in the exurbs. If they were adobe they'd turn to dust. Should everyone own a home in America, a piece of land? Is this capitalism's trajectory, our current critical moment? Terrible, Horrible, No Good, Very Bad (Week)??? Not just a very bad day. It is a Chicken Little Week and the narrative of it all is being written as we read and watch. 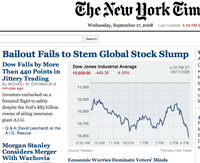 New Yorker Magazine's Daily Intel blog has this headline: Bloody Monday, Terrible Tuesday, Weird Wednesday as the Dow hit its lowest level since 2005 yesterday, after having its biggest one-day drop in seven years on Monday. "Everywhere, analysts beat the drums of doom," writes the article. People have lost 50, 60, 70% of their net worth if they were in some stocks. The Fed is trying "to ease the worst crisis facing financial markets since the 1920s". The graphics (story illustrations, magazine covers) will catch the cultural moment... but the visuals aren't out yet -- I've been looking for the best illustrations of this potentially pending doom. The Art of the Economy was a post I wrote last fall and the word Recession was artfully done by the NYTimes and its use was way ahead of the technical "Recession" (which some are still debating and I'm not an expert, so I won't parse the definition). Still, the shrilling experts like Jim Cramer were squawking and it just makes a depressing jittery week so here's my sky-is-falling art at top. Ahhhh. Steering the financial ships through the icebergs. Who's at the helm? It all became unsettled this week with an $85 billion federal loan to rescue AIG, and Merrill Lynch failures and Lehman's collapse, the latter which is six times bigger than WorldCom. It's being called a U.S. Financial Crisis, but the effects are felt globally. WaPo's photo story captures it best. I'll be heading off to visit my mom, dad, brother and cousin in Colorado. Vail should be beautiful this time of year. Even if the markets get uglier. So.... how will the story end up? As (now Santa Fe resident) and former NYTimes journalist Judith Miller received in a letter sent to her in jail from Scooter Libby, the cryptic message of the aspens all turning at the same time might be relevant: You went into jail in the summer. 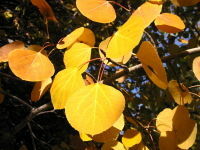 It is fall now…Out West, where you vacation, the aspens will already be turning. They turn in clusters, because their roots connect them. Roots of a financial crisis? Where does politics play into this? Does Sarah Palin understand predator control? That the wolves have to be managed? Is it all about the symmetry of sin? Fall is here... in more ways than one. Hope for the best. I'll be among Rocky Mountain aspens while the metaphorical aspens of the markets ...turn in clusters?